...Peace Prize was awarded today to an imprisoned Chinese dissident following a campaign by Chinese intellectuals to encourage awarding him the prize. I am sure that he deserved it and I wish him well. I wonder if the Chinese government will buy him a cake in jail to celebrate. Nobel was the fellow who invented dynamite. Nitroglycerin was used as the primary explosive for many years but it was highly unstable. You can cause one drop to hit the ground and it will explode. Dynamite is basically sawdust and nitroglycerin with the sawdust being used to stabilize the nitro. When I was with the Summit County Sheriff's Office we would be called on a regular basis to investigate the discovery of very old cases of dynamite in old mines and construction sites. Each of the ski areas also had caches of explosives used to blast unstable snow to control avalanches. The Colorado Department of Transportation has explosives to set off avalanches along the highways. The primary use of explosives for many years has been in war. There are so many different iterations of explosives that we would call the Emergency Ordinance Demolition (EOD) crews from Fort Carson to take care of much of what we would find in Summit County. They also would come on a regular basis to conduct classes for our officers on what is dangerous and what is not. One thing that was interesting is that the nitro would actually bleed through the dynamite and end up in the ground below the explosives and thus becoming inert and of no danger. There are stories of the old timers throwing dynamite on the campfire in place of wood. Heat will not set it off but pressure will. 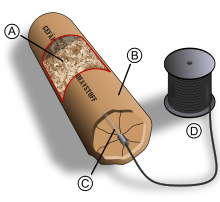 The pressure with dynamite are the explosive caps that are set off by electricity.